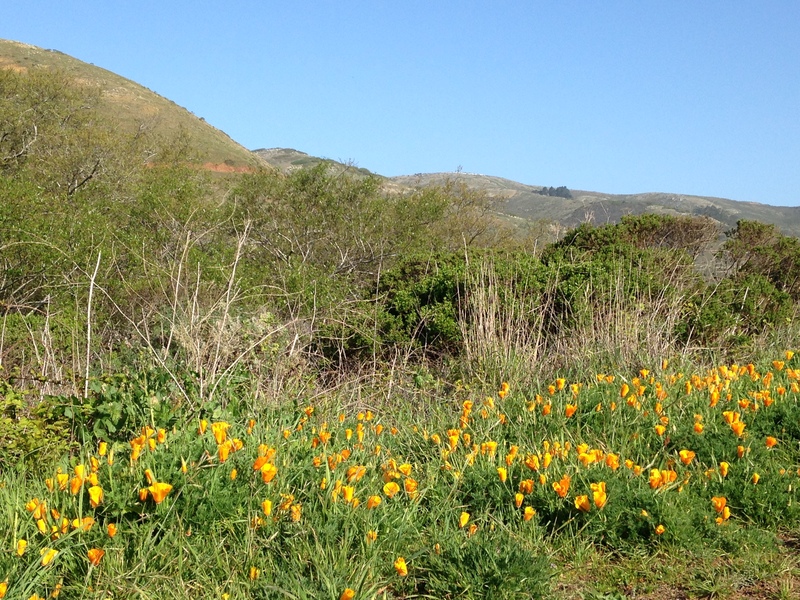 If you enjoy the lands of the Midpeninsula Regional Open Space District in the San Francisco Bay Area you get to vote every few years for the Board whose members have the responsibility to decide how those lands are used by the public. This year, 4 of the 7 wards are on the November ballot but only Ward 1 & 6 are contested. Silicon Valley Mountain Bikers (SVMTB) approached the candidates to ask them to share their thoughts. Of course, there are more issues in this election than Mountain Biking but as SVMTB is an IMBA chapter representing the local MTB community the questions deal chiefly with bike access issues. I’ve shared the candidates responses here. Other than combining the candidates answers in a single document, all responses are unedited. First, we have Ward 1 with Incumbent Director Pete Siemens and Candidate Mike Buncic with their response to the SVMTB questionnaire. The intent of this questionnaire is to allow candidates for Board seats an opportunity to address areas of interest for the members of Silicon Valley Mountain Bikers (SVMTB). We thank you for your willingness to serve the community in this very important role and thank you for your time answering these questions. We would appreciate a reply by October 22, 2014 so that we can share this information with our membership before the election. 1. What sort of roles have you had in land management agencies or similar organizations that would speak to your ability to carry out the role as a Director of MROSD? Buncic: In my mind the role that qualifies me most highly for this position is simply that I have spent thousands of hours within the lands of MROSD, travelling virtually every trail. I am highly familiar with the lands and issues related. These areas have a deep personal connection to me. As an educator my students have enjoyed the same. I have also been involved with many of the major planning processes in the past 15 years. As an employee of the Santa Clara Unified School District, I have worked within two campaigns to pass, plan and implement two major bond issues, one of these for approximately 150 million dollars and the other for 300 million. Within the two issues I had direct responsibility within two major projects as to planning and implementation, the construction of a new science facility and the renovation of an athletic facility. I have seen these things done well and I have seen them done poorly. In addition within my career as a teacher I have had many opportunities to interact with the governing board of a governmental agency, I have seen this go well and I have also seen it go poorly, to say the least. This a skill I see as highly relevant to my role within MROSD. 2. What do you see as the best new opportunities for MTB riders to enjoy MROSD lands in the coming years? Siemens: Opportunities for members to participate in public planning meetings where we discuss policies and trails as part of our Vision Plan implementation. 3. There are currently few trails that allow MTB riders access to the Bay Area Ridge Trail from the urban areas to the East of Skyline Blvd. Thus many of our membership drive to trailheads on Skyline but express interest in being able to do loops on singletrack starting much closer to their homes. Do you see opportunities to develop new trails that would allow this? Siemens: Absolutely yes; elements in the Vision Plan projects include trails from the Santa Clara Valley up to Skyline (and beyond). Most of our constraints come from adjacent agencies. I see off roadway access to Skyline as a critical need. Buncic: I refer to these types of trails as “regional connector trails” From what I have seen, this concept has largely not been considered in land planning at MROSD. Not only does it provide for a rich user experience, but it has the additional benefit of reducing both bicycle and car travel along narrow roads as well as being environmentally sound. The opportunities are many, and many of these locations will be considered under planning process related to Measure AA. I could not vote in approval of any plan that does not take multi-user trail improvement into consideration. Ill list a few; Razorback Ridge, Hamms Gulch and the Lost Trails at Windy Hill, Page Mill Trail at Los Trancos, Black Mountain Trail at Monte Bello, a planned extension of the Stevens Creek Trail into Monte Bello, the combination of John Nichols trail ( SC County Parks) and an eventual through trail at El Sereno to Lexington Reservoir, Lexington Reservoir to Skyline via Bear Creek Redwoods. Sierra Azul through trail from Los Gatos to Highland Way via Loma Prieta. and more…. 4. The outdoor experience that Mountain Bikers seek is not that different from other trail users. We want to enjoy a close connection to nature that singletrack trails allow as well as the challenge inherent in navigating such trails. Other park districts have made efforts to develop these multi-use trails. A local example is the Emma McCrary trail in Santa Cruz. 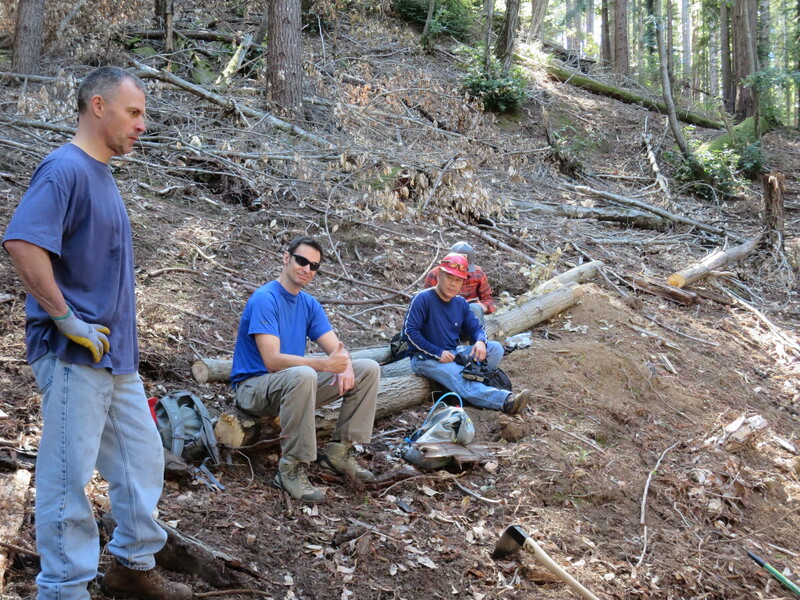 Are you supportive of efforts to develop trails within MROSD preserves that have similar features? Siemens: I am not familiar with the Emma Trail; however I think single-track trails are a good addition to some of our preserves so long as they are environmentally sound and are treated with respect. 5. What is the best way to work with you to better understand the interests of mountain bikers? How will you balance the needs of the various trail users? Siemens: See #2 above; also the ‘needs’ of various users involve mutual respect. I have and will continue to support our education efforts to accomplish this. Buncic: The key concept here is simply communication. I feel strongly it is the responsibility of a board director to go well beyond the usual public commentary process and to be familiar with the thoughts of the public he or she serves. They must actively pursue it. I will be sure to be easily available, not to mention regularly out on the trail myself. In addition to my previous comments on multi-use issues, education is a key component of trail use. That can only occur if user groups are brought together to participate in the outdoors cooperatively rather than segregated. But that goes for me as well. I must be as experienced with the needs of user groups as they of each other. 6. Is there anything else you would like to tell our members before they cast their votes? Siemens: I am encouraged that national bicycle organizations recognize our extensive provision of trails for bicycles; I am also thankful for the thousands of hours of trail projects the various clubs have given to the District. Buncic: I can assure you I will make every effort to move MROSD into a more diverse user environment, and increase the public’s awareness of, and participation in the preserves. I would like to see a much larger segment of the population experience the settings that I have been fortunate enough to. Next we have Ward 6 with Incumbent Director Larry Hassett and Candidate Brandon Lewke with their response to the SVMTB questionnaire. Hassett: I have been a Board member of the Midpeninsula Regional Open Space District for the past 14 Years, representing Ward 6. I have been a strong advocate for increasing the resources dedicated to land management and public access during that period and was a strong, active supporter of the essential policy changes in the 2012 Strategic Plan and 2014 Vision Plan that led to the passage of Measure AA. Lewke: Great question. My background is in nonprofit finance, where I am responsible for accounts receivable for a $17M annual organization in the middle of a $50M, 5 year exhibit renewal campaign. Every day I handle other peoples’ money. I am also responsible for creating the monthly department income statement reports for 25 departments and project reporting for over 40 active projects. I know what a restricted fund is, I need to be able to put my hand on my heart and say that a gift was used for the purpose as intended by the donor. The largest check I have held in my hands, not with my name on it, is over $3M. The measure AA funds are restricted funds, wouldn’t you like a caretaker who is familiar with the concept representing you? With the CFO I create the monthly finance committee package and attend the monthly finance committee meetings. I have great personal and professional integrity as a steward of others property and have been the primary liaison for the annual audit for the last six fiscal years with my organization’s auditors. All six audits came back clean; no material weaknesses or significant deficiencies. Hassett: With the Passage of Measure AA, there will be tremendous opportunities for more access throughout the District. Already completed is the staging area at Bald Mountain and the Summit trail from Bald Mountain up to Mt Umunhum nearly completed. The opening of the Sierra Azul trails, because of the large size of that preserve (18,000 acres) represents one of the very best new opportunities for MTB rides in our region. 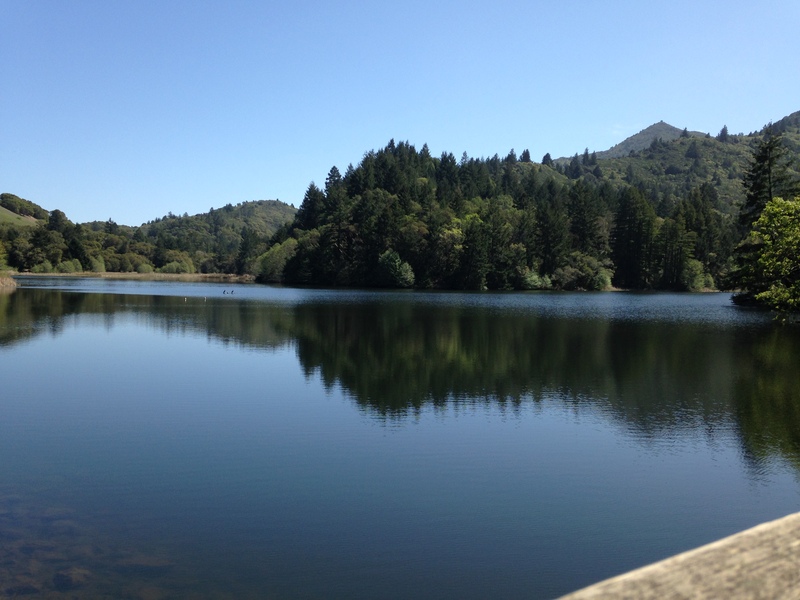 Other notable trails would be the mid section of the Stevens Creek Trail, trails throughout the La Honda and Bear Creek preserves, completion of the Purisima to the Sea trail, and additions to the Bay Area Ridge Trail. 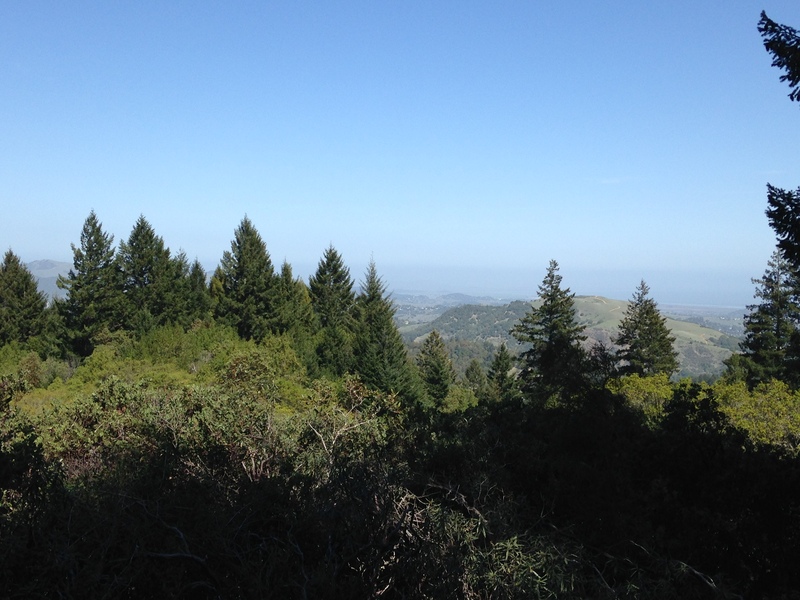 Lewke: In my Ward I am eager to get La Honda Open Space Preserve open in my four year term. I also would like to see a multi-use trail that connects La Honda to Woodside/Portola Valley open, in an effort to get bikes off of 84 for safety reasons. This trail would be a mountain bike and road biking trail, dirt on one side and paved on the other. I would also like to have mountain bikers on a trail committee with me and members of the Mid Pen Field Staff to evaluate a system for determining where is the greatest interest for biking trails and where it is realistic. The arbitrary 60% open to bikes is too low. I would like to see it closer to 75%. Is that achievable in four years? I don’t know, I prefer to shoot for the moon and if I miss, still land among the stars. Hassett: Although I fully support additional trails coming up from the urban area to Skyline, few opportunities currently exist for improving this due to land ownership issues. However, with the Passage of Measure AA, the District now has the acquisition capacity to close gaps in this area as opportunities become available. Short term, the District is working on the Alpine Road trail at Coal Creek, and getting started potential new trails at Windy Hill with links to other preserves. Long term it’s a matter of acquiring key parcels when the opportunities arise. Lewke: Certainly, parking lots seem like an afterthought at nearly every open space preserve, if bikers can help identify locations on open space land that could be a mountain biking or multi-use trail start, that would be beneficial. There is only one of me, there are many of you, I prefer to work as part of a team, than to do everything by myself and hope you are happy. I am open to exploring possibilities, please help me serve my community by offering your input! Hassett: I have not personally experienced the Emma McCrary trail other than seeing it on the internet, however I will put the quality of Midpen’s trails up against any other park agency in the Bay Area. We have some of the best world class mountain bike trails throughout our preserves, designed, built, and maintained by our staff and our ability to increase the availability of such trail will now occur as public access is expanded through the implementation of Measure AA funded project. Lewke: Absolutely! 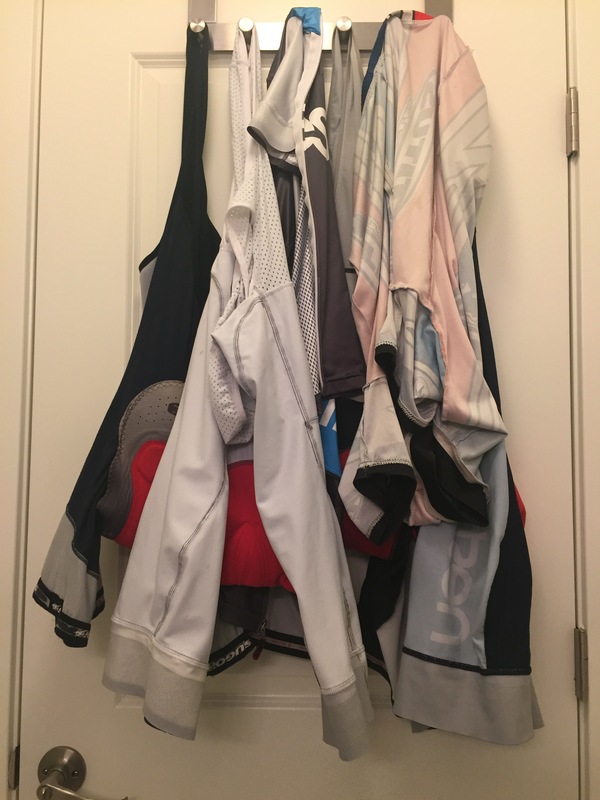 I spent four years of my life growing up in Germany, biking to and from school and soccer practice, and going on longer typically one to two week biking trips during the summer with my family. We biked often on multi-use trails along rivers between 40-70 miles a day, stopping to visit cathedrals and castles along the way. I do not see a reason why we cannot convert many of our existing trails to multi-use or create new multi-use trails. We have 62,000 acres of land, with slightly more than half of it open, I would like to have more of it open so we can experience more adventures together. I would encourage the mountain biker community to weigh in on the idea of mountain bike trails that follow a legend similar to skiing: green bunny slope trails, blue intermediate trails, black diamond ‘be sure your life insurance policy is current’ trails. This would help mountain bikers of different experience levels to enjoy open space without creating friction by managing users’ expectations. Hassett: SVMTB has been instrumental in prioritizing capital improvement projects for the District. During our Vision Plan workshops the mountain bike community was well represented. Several members of SVMTB were part of our Citizens Advisory Committee. I recommend your members continue to participate in board and committee meetings as we roll out new projects. Staff and the General Manager also began to explore the creation of a “multi-use” forum to bring all trail users together to ensure that issues could be openly discussed and solutions proposed by the user groups. This effort had to be suspended with activity around the Vision Plan and Measure AA, but I think it is worth pursuing again as Measure AA see more lands opened to the public for multi-use. Lewke: The best way to help me understand the need is to invite me to come ride with you and see what you are talking about. I am a good road cyclist, I try when possible to bike once a week from my home in Redwood City to work in San Jose. It is 23.5mi one way, taking around 90-100min depending on traffic. I am a novice mountain biker, having primarily ridden in Arastradero Preserve. You may need to ‘take it easy on me,’ I may not be the greatest hill climber, or bravest thriller seeker, but I do own a mountain bike and want to become more proficient with it! I believe we live in a democratic society and need to balance the needs of various trail users accordingly to the proportion of use they represent on the trails. I believe the majority users of open space are pedestrians, a large but growing minority is mountain bikers, and the smallest contingent are equestrians. I think wider and more multi-use trails would be my preferred approach, a secondary approach based on compromise not involving widening existing trails would be making certain trails open to bikes say on odd days of the week and equestrians on even days, so there are no complaints concerning horses or bikes ‘interfering’ with the other groups enjoyment of the space. The third approach is to have some biking trails that run parallel but separate from, or just have plain separate trails open exclusively to mountain bikes. Hassett: Measure AA was a real boost to the Districts ability to complete some long delayed projects. Over the course of the next few years as we ramp up our ability to make these projects happen, the mountain bike community will definitely see substantial trail opportunities. I am personally pleased that SVMTB has participated in our processes to date and I welcome their continuing participation work to implement and grow the best trail system in the region. Lewke: I have a bike and like to bike! If you want someone like that to represent you, please vote for me and encourage your friends to do the same! To learn more please visit facebook.com/votelewke and democracy.com/votelewke Please like my Facebook page, share it with friends, post on it that you support Brandon Lewke and his vision for more multi use and biking trails. Look forward to earning your vote November 4th. I’ve been intrigued by single chainring drivetrains for mountain bikes since friends started using them 4 or 5 years ago. Back then, with a max rear cog of 34 teeth it was somewhat limiting for climbing since I REALLY like my granny gear. I end up riding at Henry Coe and other locales with long, sustained climbs and really appreciate a 22/34 or 24/36 combination for the steep grades. With SRAM out-innovating Shimano again ( just a few years ago they made double front chainrings for mountain bikes mainstream) this time with their 1 X 11 offering it’s finally possible to run a single front chainring and get pretty much the full range available with a conventional drivetrain. Where SRAM impresses me the last few years is their willingness to ignore conventional wisdom and just solve a problem. In this case they said ‘Why not offer a cassette that goes from 10 teeth to 42?’ The challenge was that the smallest conventional cog offered for years had 11 teeth and rear hubs were designed around this ‘standard’. SRAM decided that this was too limiting and got the hub manufacturers to support them in their move to the smaller cog. Of course, all this comes at a substantial cost. If you already have a bike it means buying a complete drivetrain and rear wheel (or freehub). This can easily hit $1500 or more likely $2000 and up depending on your appetite. So when a number of (mostly) small manufacturers started to offer upgrade options for 10 speed users I was very intrigued. The premise was to install a 42 tooth cog next to the existing 36 tooth cog and toss out one of the smaller cogs (usually the 15 or 17 tooth). Then if you paired this new cassette with a 30 tooth (in my case) chainring you could get almost the equivalent gearing of many riders granny gear setups. You still have to compromise a bit since there is no 10 tooth option but if you aren’t racing the lack of top-end speed probably won’t hurt too much. One of the impressive things about the SRAM setup was using a chainring that has alternating thin/wide teeth. This allows a closer fit of the chain to the teeth on the cog resulting in better chain retention. A ‘full profile’ tooth also helps and is possible since the chain doesn’t need to be derailed from the chainring. Fortunately several manufacturers are offering similar chainrings that will adapt to most common cranksets. One other important aspect of the setup is having a ‘clutch-type’ rear derailleur (introduced in the last few years by both drivetrain companies) that does a better job of keeping consistent chain tension than conventional derailleurs. Fortunately I already had one since I smashed my old derailleur about 6 months ago and upgraded when I bought the replacement. 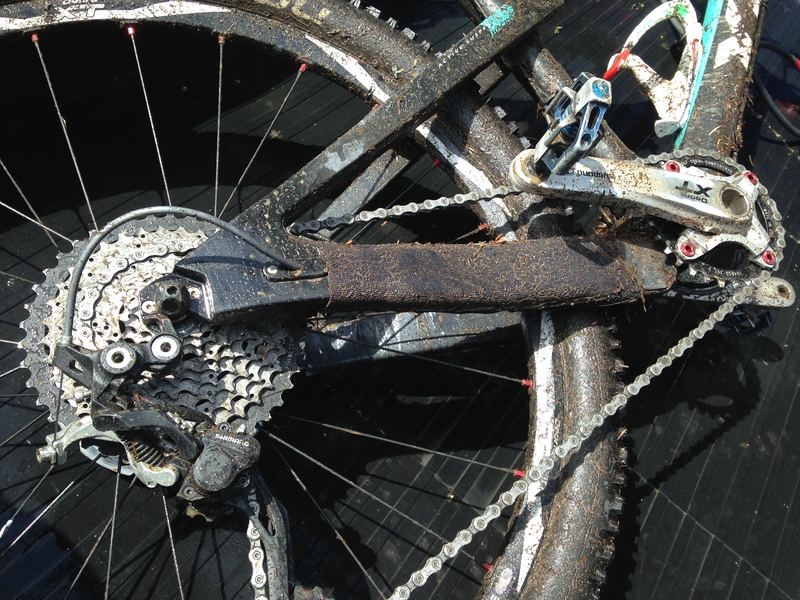 If you don’t want to pay for a new derailleur you could try the conversion and upgrade the rear derailleur only if you notice a lot of dropped chains. In my case I decided to go with the Wolf Tooth Components hardware. I liked their website and their approach to solving the problem and they are getting good reviews. Installation and setup was pretty easy. If you are used to doing your own maintenance it won’t be a problem. If you aren’t comfortable making derailleur adjustments and removing a chain definitely have a shop do the upgrade for you so it’s done right. The first thing you have to do is take a bunch of parts off your bike. Get rid of the left shifter and cable. Remove the front derailleur. Take the chainrings off your cranks (in my case 3 rings). Then install the new chainring – that’s easy. Then it’s on to the cassette. If you’ve installed a cassette before this will be simple for you. Remove the cassette from the freehub. Then put the new 42 tooth cog on the hub followed by the other cogs. You’ll need to discard one of the cogs. In my case the only individual cogs were the 15 and the 17. Per Wolf Tooth’s recommendation I chucked the 17 but some people toss the 15 I’m told. There is a bigger percentage jump between adjacent gears if you get rid of the 15 so it made sense from me to ditch the 17 as they recommend. Then just tighten up the cassette lockring and put the wheel back on. The next thing you need to do is determine chain length. I was surprised that my chain didn’t need to be shortened. It was the correct length already so that saved a bit of hassle. With everything back together the next step was to adjust the mysterious B tension screw on the derailleur. I turned mine all the way in but still got pulley to cog contact. Fortunately my Wolf Tooth cog included a long screw just for this case. Be aware that they no longer include the screw so you may need to order the long screw from them (fortunately it’s only $1). Their instructions for this adjustment were very clear and I had this one done in about 5 minutes. I didn’t even need to adjust the derailleur limit screws. Then a quick ride outside to confirm it was working and I was ready to go to the trails. Usually when I try out new hardware I ride alone so that I don’t disappoint friends by breaking down and ruining their day. But I figured I would take a chance this time. 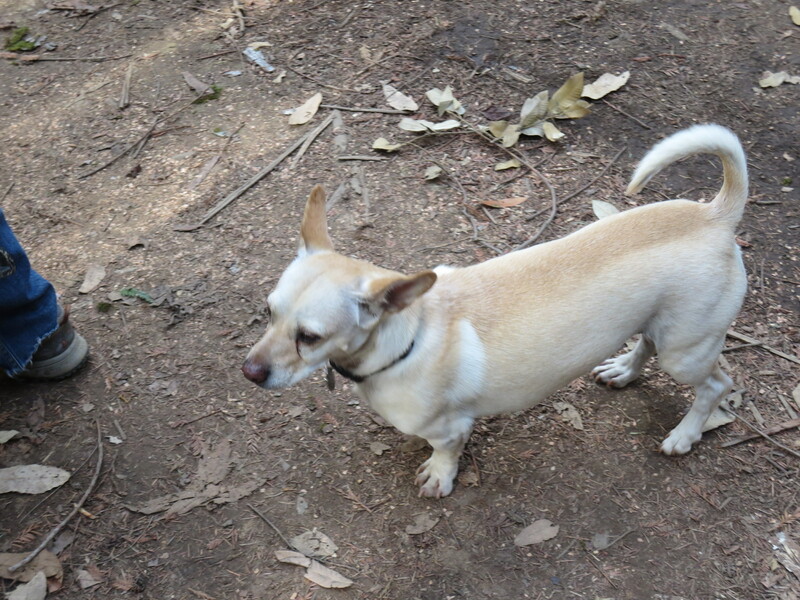 We were doing a relatively short loop at Skeggs Point so even if I had to walk back to the car it would be a short walk. The setup instantly felt right. Shifting was crisp and quick and there was no noticeable difference in performance when shifting in and out of the 42 tooth cog. The simplicity of using just a single derailleur is great – even though I’ve shifted front chainrings for a long time it was nice to have one less thing to think about and I found I was using my dropper post more since I didn’t have to worry about accidental front derailleur shifting. We happened to hit Skeggs on a misty, slightly rainy day so there was plenty of grit thrown up on my bike and a few puddles. But not a single bad shift or dropped chain. Since that first ride I’ve had 2 more with the setup and it’s been perfection every time. For my Yeti ASR 5C I would never go back to a dual or triple chainring setup – there is just no need. However for my other mountain bike – a 29er hardtail I will stick with the 2X10 setup. I use that bike for longer rides and often ride to and from the trailhead on roads so having taller gearing is a real plus on that bike. I know I would have to compromise either on the climbing capability or top end if I went with a 1X10 setup on the hardtail. Now if I could only afford the SRAM 1X11 offering with their wide range I would be very tempted to try that out. Reportedly SRAM will be offering 1X11 in lower pricepoints in the near future so that just may be an option. One unusual aspect of this upgrade is that you’ll take so many parts off your bike that you might pay for your purchase by selling your old shifter and chainrings if they are in decent shape. 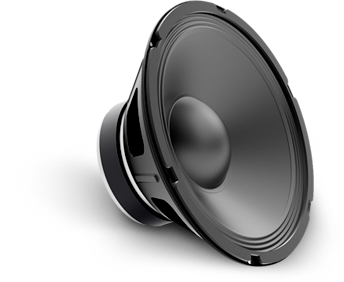 So consider the resale value of your takeoff parts when you budget for this upgrade. Two of the great enablers are the Clipper Card which allows you to take just about every type of transit in the Bay Area without taking any cash and Google Maps on your smartphone which helps you find the next transit option. And surprisingly, transit helps mountain bike riders and not just roadies. Sure, you can’t catch a bus up to Skyline and Demo but light rail goes to Santa Teresa, Alum Rock and Campbell which puts you within a short pedal of some decent trails. I’ve also taken Caltrain to Belmont and pedaled the 1.5 miles to Waterdog. When we lived in the UK for a couple years we used the extensive rail network on a few multi-day loops and more frequently on day rides. Sometimes it was just to get in a bit of variety and other times it was to get back home after we got caught in the all-too-frequent downpours. When we moved to Mountain View, one of our reasons to pay the extra rent was the easy access to 2 different rail transit options and the 22 bus going up and down El Camino Real which means we aren’t so reliant on the car. My old friend Andy introduced us to the Caltrain, Golden Gate Bridge, Mt Tamalpais, Tiburon dirt loop with return to SF via ferry. 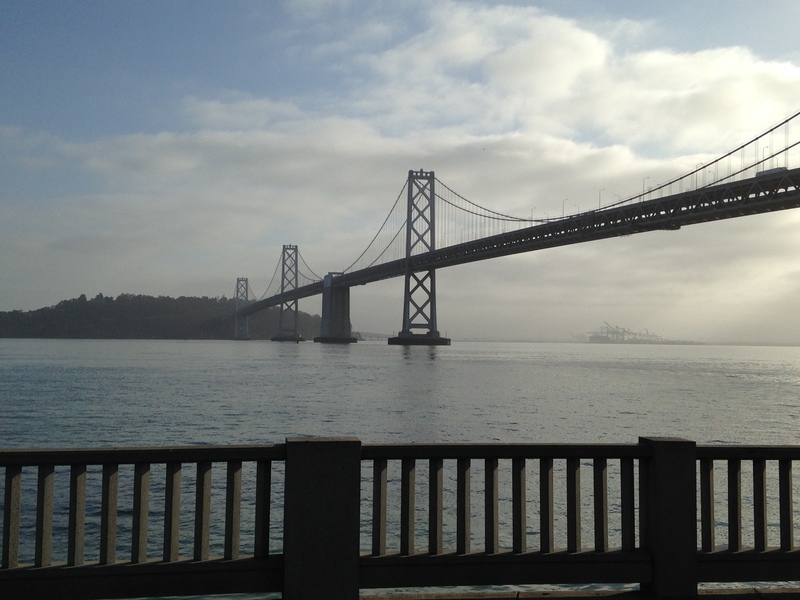 Starting a ride like this with a sunny-day pedal along the Embarcadero with views of the Bay Bridge and a crossing of the Golden Gate would make any tourist jealous. 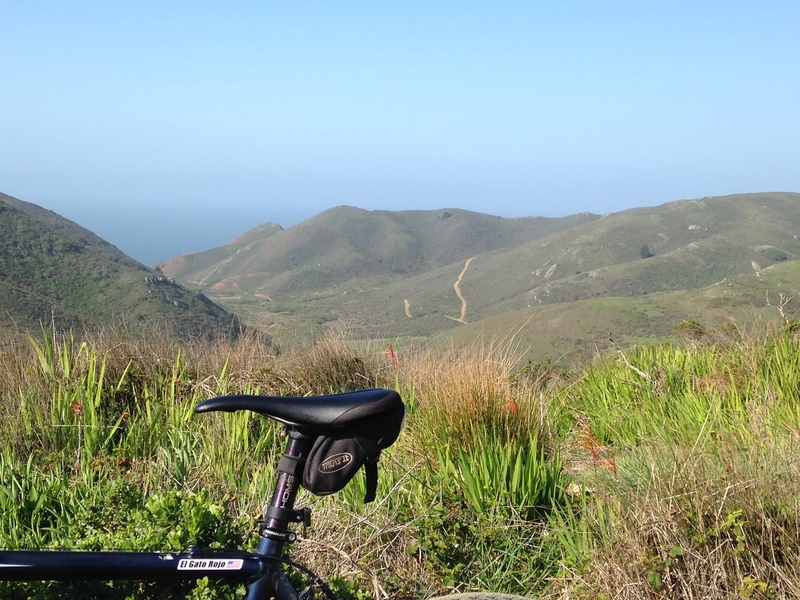 It gets even better once you hit the dirt in the Marin Headlands and make your way to Mt. Tam. The trails aren’t very technical, with the vast majority being fireroads, but the scenery is as good as you can hope to get so close to such a dense urban area. 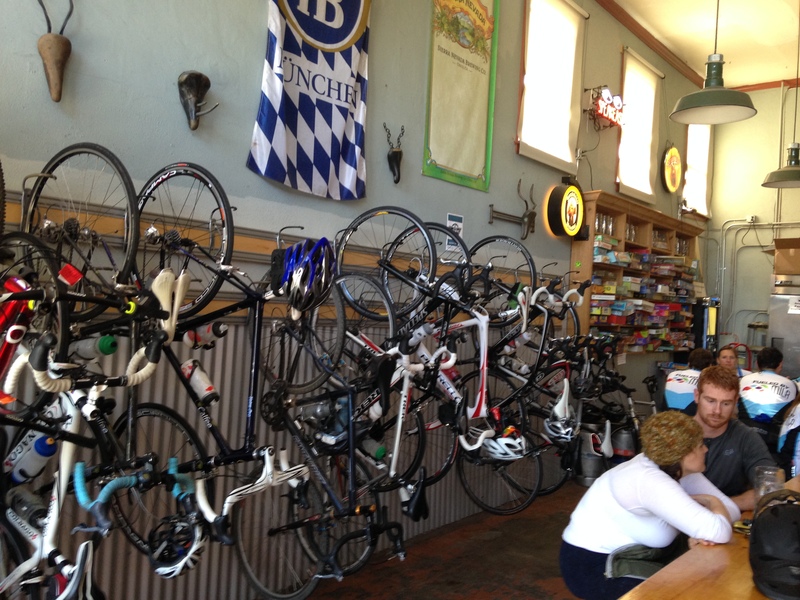 I did a variant of the Mt Tam ride the other weekend with my target destination being the Gestalt Haus pub in Fairfax. It has to be one of the most bike-friendly places in the Bay Area with bike parking INSIDE, a range of quality beers on tap and reasonably-priced food off the grill. I also thought my new route (carefully mapped out on ridewithgps.com) might be a bit easier since it didn’t climb all the way to the top of Mt. Tam. The stats said it would be 5000 feet of climbing but that COULDN’T be right could it? My day started off with a quick ride to downtown Mountain View for a cup of coffee before I caught the first train North. 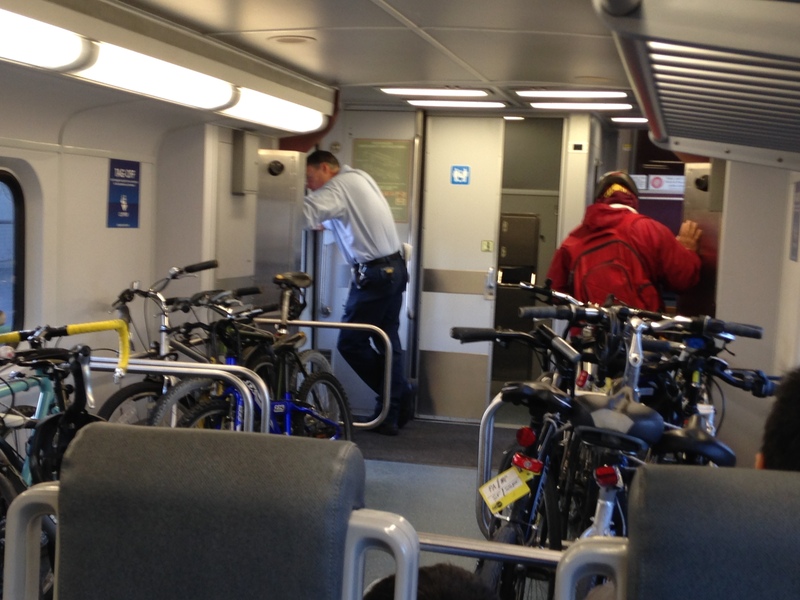 There were a surprising amount of other cyclists on the train at this hour – maybe everyone had a big day planned. I always like the first transit ride on any trip. Whether for a day trip or a month away there is a feeling of possibilities and excitement and never being completely certain what will happen. I arrived in SF just after 8:30 and was a bit surprised to find sunny skies and warm temperatures so early. All I needed was a light jacket for my pedal along the Embarcadero which was an easy cruise with just a few tourists at this early hour. 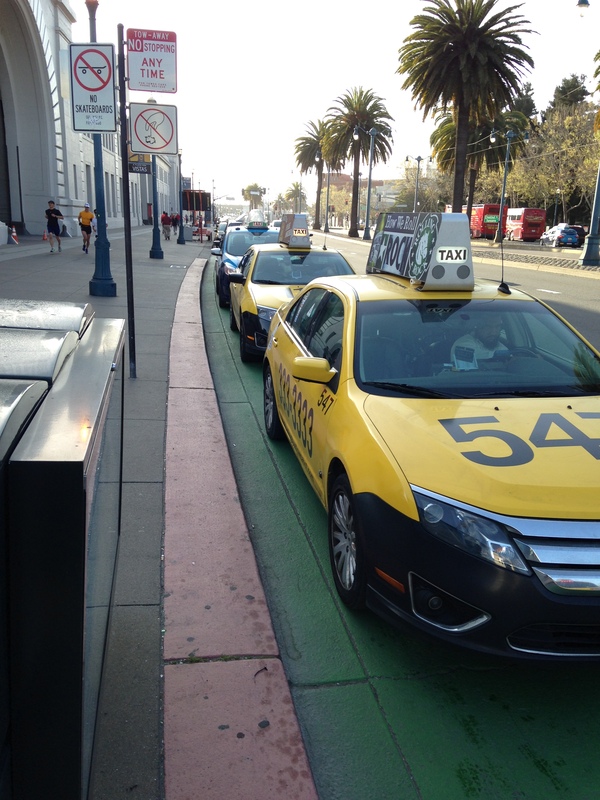 A huge cruise ship was docked just a bit further up the Embarcadero disgorging it’s thousands of customers into a long line of taxis that were idling in the bike lane. Not too much of a problem as I was going by but I had to wonder – when does ‘Bike Lane’ mean Bikes Only – just when it’s convenient? 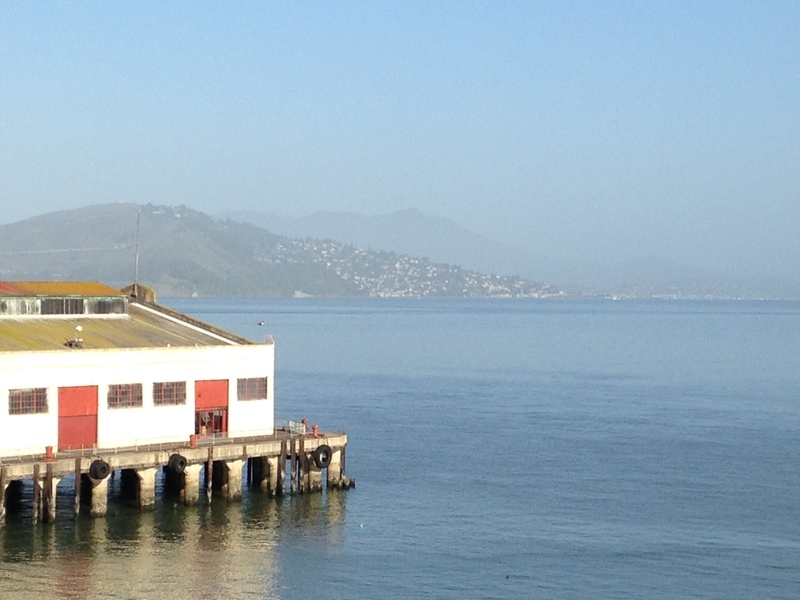 After this it’s a pleasant cruise through Fisherman’s Wharf, then Maritime Park where the swimmers are always out early and then the little climb through Fort Mason where I get my first view of Mt Tam seemingly a long way away. 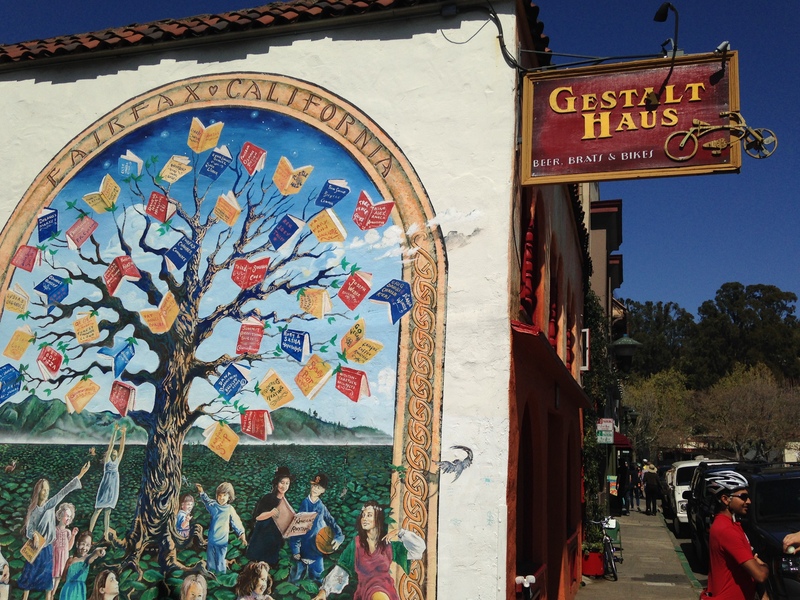 I had a brief second thought about the trip but considered what was waiting for me at Gestalt Haus, the perfect weather and the snowstorm my family was experiencing back East so I rode on towards Crissy Field. This was the first time I had ever done this ride alone so it was nice to stop wherever I wanted and not worry about time. I read a lot of the signs and stopped a bit longer than usual at every overlook. The Golden Gate Bridge crossing is always spectacular and since cyclists are on the West side you get a view of ocean and wild lands that the pedestrians on the other side don’t get to enjoy as easily. 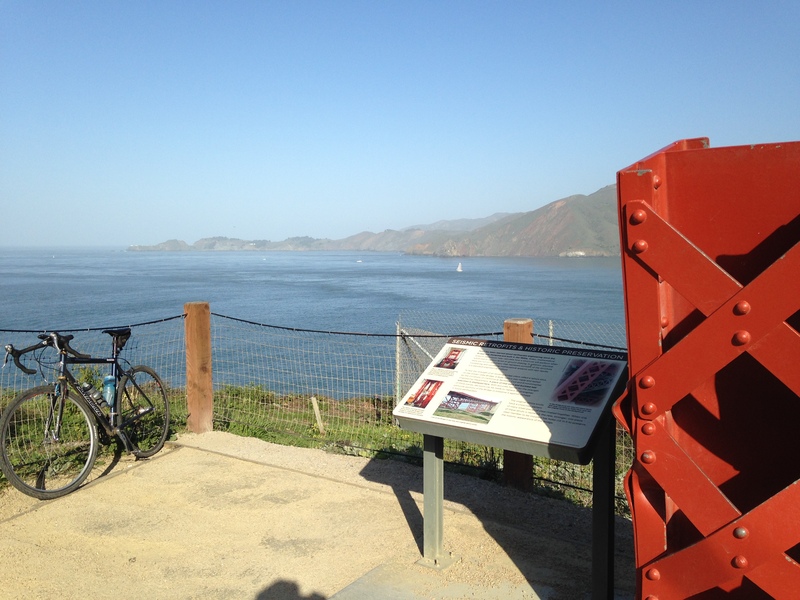 Soon I”m across the bridge and up the road into the Marin headlands. Fairly stiff first climb of the day but hard to notice my effort with the view of the Pacific and the coast wrapping around to the South. Where the climb levels out I get my first taste of dirt on a downhill fireroad that’s fun and a little loose on the cyclocross bike. A great feeling since I know I’ll be on dirt for several hours now before returning to pavement just above Fairfax. Bottoming out in the first valley I have a view of green hills and lots of Poppies. Marin had a pretty good rainfall a few weeks back when the Peninsula got very little and the green hills and wildflowers are the evidence. and from there I had just a bit more dirt until I was in Fairfax. I had about 2 hours to hang out in Fairfax since the Larkspur ferries don’t run as frequently in the off-season so I enjoyed a couple of beers and a large Kielbasa piled high with sauerkraut. My day could have happily ended here but I still had a flat 7 mile pedal ahead and the 30 minute crossing back to SF. 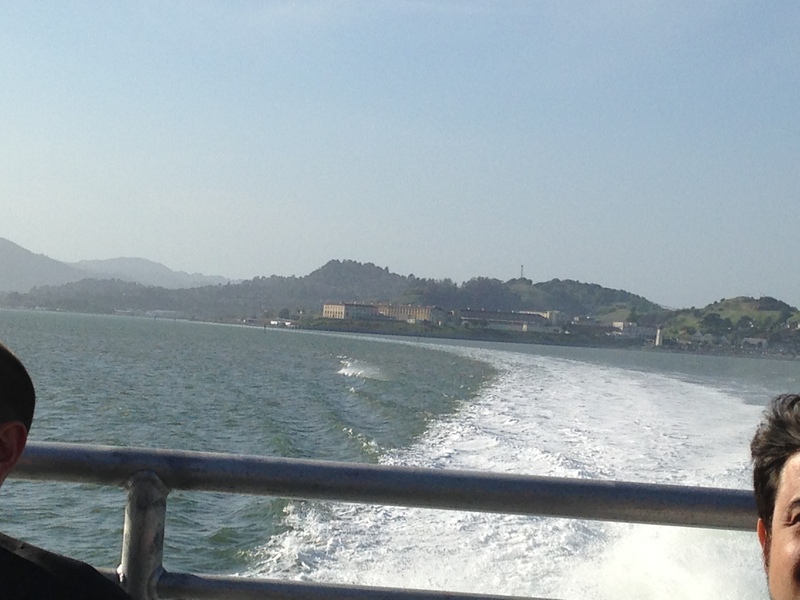 The Larkspur ferry is absolutely worth the price of admission with views of Tiburon, Angel Island, San Quentin, Alcatraz and seemingly the entire Bay Area on this sparkling day. At the SF ferry building with still an hour to wait for the ferry to Oakland so I decided to take BART to meet my honey and the rest of her group in time for dinner. So that gave me 3 different transit modes and about 42 miles of mixed terrain goodness for the day. 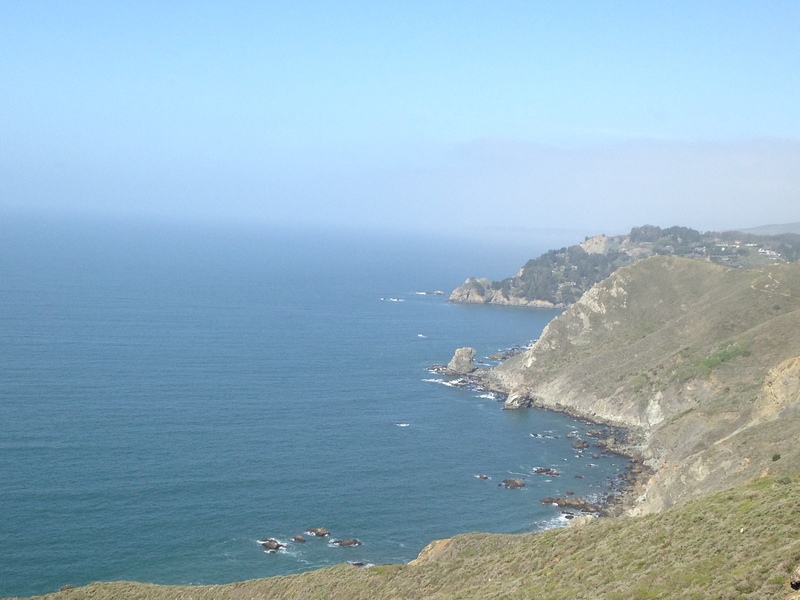 And best of all, my mini-vacation helped me see the Bay Area in a whole new light. What about you? Do you have any favorite transit-supported rides? Really great to actually get some digging time at the Flow Trail! I had seen the plans but had not seen the trail until Saturday when I went out for the first official volunteer trail building day. A lot of work had already been done to machine-cut the trail but there is still more on tap to shape the trail and provide good drainage. When it’s all done we’ll have 4 miles of berms, rollers and other features to keep us entertained. It’s great to see this happening for Mountain Bikers. I was told that over 30 volunteer crew leaders had been trained over the last few months. The crew leaders for my team were Robert and my old friend Norm. 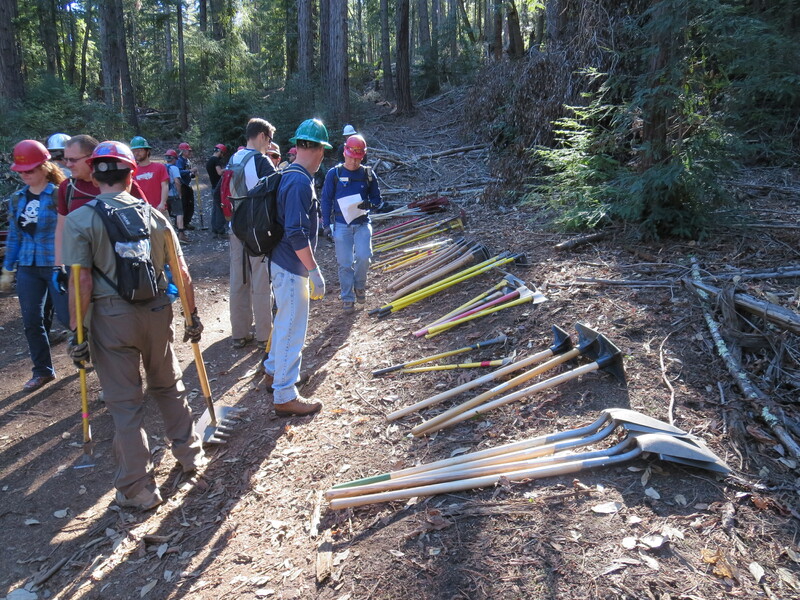 After a safety discussion we grabbed a selection of tools and walked down to our section of trail where we discussed the work we had to do for the day. That’s Norm on the left and Robert on the right at our lunch break. In the middle was Dirk who was another volunteer. 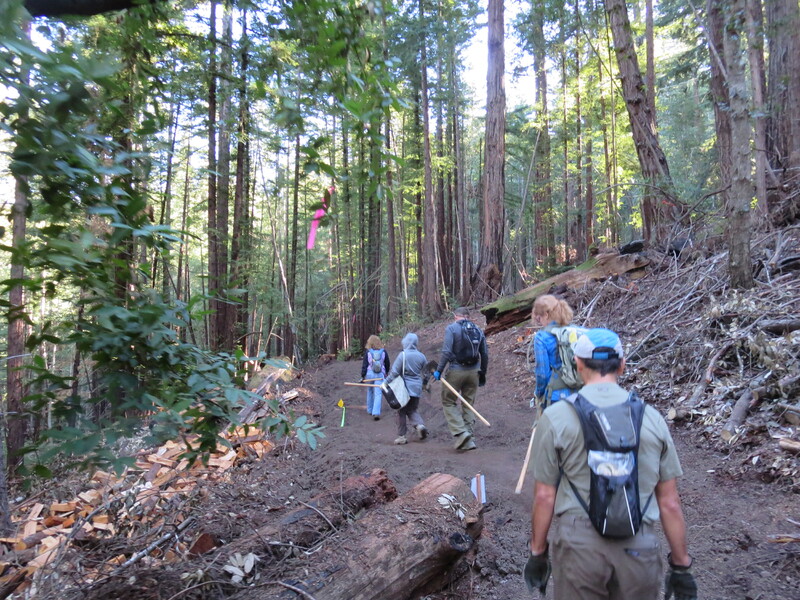 The Stewards of Soquel Forest sponsored the workday which meant they had plenty of good food and drink both before and after our effort. And we had 3 trail dogs along to entertain us. I didn’t get the name of this little fella but he was having a good time and those little legs of his were working overtime.